Susan. Mom of 3. Corporate Climber turned Lifestyle Blogger. Fuelled by lattes, yoga, perspective and purpose. My reason? because after working with Seniors for over 20+ years I got a hard look at what “Legacy” looks like in terms of “who you want to be remembered as”. Working with Seniors pushed me to look at my life through a different lens and encouraged me to create a life I wanted to live instead of just living one. After having my 3rd baby I knew that life needed to change. I needed to fulfill me instead of what society suggests we should. I took the opportunity of a “break” from my career to start stripping away layers in an effort to redefine me and what I wanted a successful and fulfilled life to look and feel like. In the process I just started to write without ever even knowing that “Blogging” was what I was doing. I just knew that if this was something that I was going through, there had to be other women out there too. Slowly a community formed. I never set out to be a Blogger or Influencer – all of the terms, expectations and definitions of it often leave me cringing. I just want women to know that they have the power to change their lives to be whatever they want it to be. You just need to drop the self-judgement, expectations that others have put on you and start believing in yourself beyond measure. If I want to influence anything it is simply to start living a life on your terms. It’s possible. And when you start to take steps towards it your life will unfold in ways you never expected it to. And certainly in a way that no title or paycheque could ever provide you with. I’d like to think this is a “side gig” although it has manifested into something more than I ever would have expected. From a mom who just wanted to share her story I am now able to work with people and brands that I love, and believe in to create meaningful content using my own authentic voice. Pretty unbelievable and powerful when you think about it. 3) One of the biggest blocks to Moms acting on their aspirations is finding the time. How do you make time amidst a busy family life to pursue your passions and/or meet your business goals? I believe that my kids are my reason, not my excuse. I make time for what matters most. I say NO a lot and ask for help when I need it – almost daily. I believe that to be good to others you need to be good to yourself. It doesn’t mean you are weak, it doesn’t mean you aren’t capable, and it doesn’t mean you are a failure. I always look at what we have gained because of it. Not everything is always going to get done, you kinda just have to get over that pretty quickly and focus on what you DID get done. It’s usually a lot more than what you didn’t. It’s just a matter of perspective and what you choose to focus on. 4) Have you met any resistance/judgement/blocks/obstacles while pursuing your endeavour? If so, what were they & how did you persevere? My experiences. You know – we get so caught up in these inspirational quotes. Yeah, they are great and sometimes the kick-starter you need, but at the end of the day if you aren’t in tune with your life, how you are feeling and what you are experiencing – no glorified inspirational quote is going to change your life. Taking action will change your life. You need to start showing up, being present and taking action……its just that simple. What do you fear the most? It’s often rooted in what others will think. You have to get to a place of believing in your purpose and passion so much that you don’t care what others think. Agh – if we could just drop judgment – of ourselves and others – think about how different life would be. Exactly. My kids. But more importantly my daughter. She sees, hears and mirrors everything I do. EVERYTHING. We are so quick to tell our kids that they can be and do anything that they want in this life……but do we model it? I see how she comes alive when she does the things that she is passionate about. I want her to life a life rooted in those feelings. I think this world would be a much different place if we all did more of what we love. I decided to start putting my money where my mouth was. Less talk, more action. They love it. I am a happier and more fulfilled mom and I’m also not getting on a plane every few days. Giving up my career title literally gave me my life back. Every lesson you are looking for can be found in them. To live more and stress less. To dance, to sing, to be silly, to love unconditionally, to not care what people think, to express yourself without holding back…….I believe that we have the kids that we do so that we can learn the lessons in life that we truly need to learn. Thank you, Susan, for sharing your insights and perspective. I can really relate to her realization that if we are encouraging our kids to chase after their dreams we have to be modelling to them what that means and shed the expectations society puts on Moms of what they “should” be doing and instead go after the things that set our souls on fire! 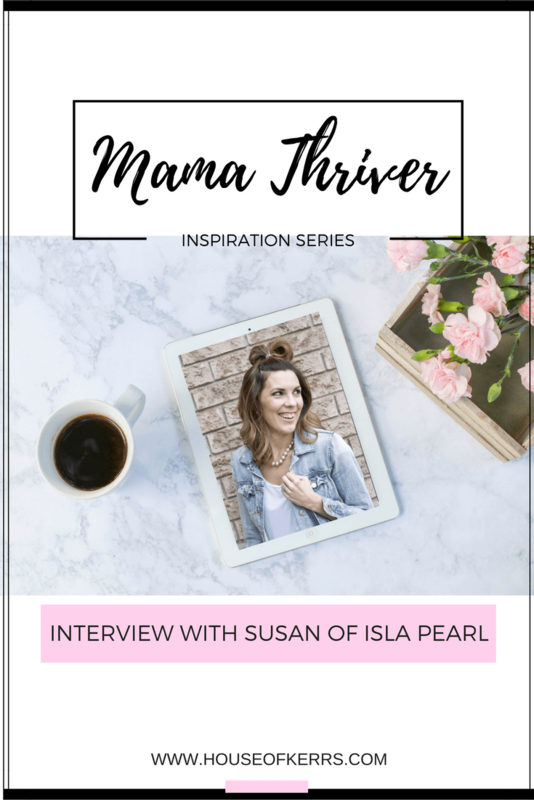 I’ve really enjoyed my digital connection with Susan, and hope you found some inspiration here to make your own dreams and visions happen, Mamas! You can follow more of the unfolding of Isla Pearl Isla Pearl on Instagram | Facebook | Pinterest | Twitter .